After experiencing decades of impressive economic growth, the Chinese express widespread satisfaction with the free market system and with the gains they have made over the past generation. However, they have grown increasingly worried about major domestic issues over the last four years. Today, the public is more likely to express concern about many economic and consumer safety issues, such as food safety, old age insurance, education, and conditions for workers. They also voice serious doubts about economic fairness, with a broad majority saying there is a growing gap between the rich and the poor. About nine-in-ten (92%) Chinese say their standard of living is better than their parents’ at a comparable age, including 39% who say it is much better. The Chinese are more likely than any public among the 21 nations included in the 2012 Pew Global Attitudes survey to say they are better off than their parents. When asked to compare their current finances to how they were doing just five years ago, 70% of Chinese say they and their families are better off now than they were then; 21% say they are doing about the same and just 5% say they are worse off. Of the 21 countries surveyed, only the Brazilians hold a similarly positive assessment of their economic progress. Nearly three-quarters of the Chinese public (74%) agree that most people are better off in a free market economy, even though some people are rich and some are poor. About one-in-five (19%) disagree. Support for capitalism is widespread across age groups, education levels and income brackets. Among the 17 items tested on the survey, rising prices is the only one rated a very big problem by a majority of Chinese. 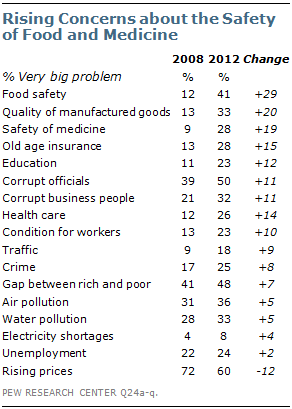 Roughly half hold this view about corrupt officials (50%) and the gap between the rich and the poor (48%). However, all of the other issues tested, with the exception of electricity shortages, are considered at least moderately big problems by a majority of Chinese. There is far more concern about domestic issues today than there was in 2008, when the Pew Global Attitudes Project last asked this question in China. The change has been most dramatic with regard to food safety, which has received a lot of attention in China in recent years; 41% consider this to be a very big problem in their country, compared with 12% four years ago. Similarly, about three times as many people now say the safety of medicine is a major problem as said the same in 2008 (28% vs. 9%). And the percentage describing the quality of manufactured goods as a very serious problem has jumped 20 percentage points over the same time period. Double-digit increases since 2008 are also evident in the percentage of the Chinese public that considers old age insurance, education, corrupt officials, corrupt business people, health care, and conditions for workers as very big problems for their country. Concern about traffic, crime, and the gap between the rich and the poor has also gone up, but to a lesser degree. In contrast, of the items tested, only rising prices are now considered to be a top problem by fewer people (60% today vs. 72% in 2008). Despite broad support for capitalism, the public expresses concerns about growing inequality in their country. Most Chinese (81%) agree that today the rich just get richer while the poor get poorer, including 45% who completely agree. Only 12% disagree. In addition, while a plurality (45%) believes that most people can succeed if they work hard, a significant minority (33%) says hard work does not guarantee success. Higher-income Chinese (62%) are more likely than those with lower incomes (44%) to believe hard work is rewarded. The Chinese public also expresses support for government intervention to help the poor. When asked which is more important, roughly half (51%) choose an active role for the state in guaranteeing that no one is in need, rather than having individual freedom to pursue life’s goals without government interference (34%). Nonetheless, support for a social safety net is down 12 percentage points since 2011. 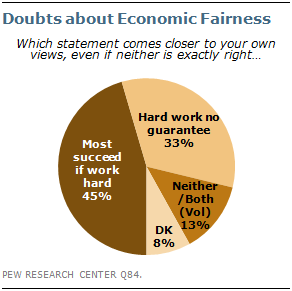 Views about hard work and success are linked to opinions about government and the economy. 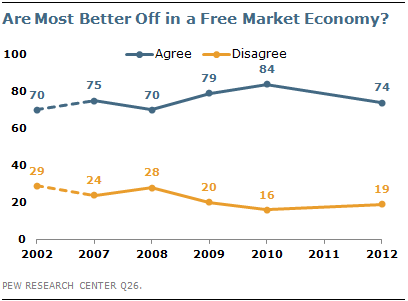 Those who say hard work is no guarantee of success express greater desire for the state to play an active role in the economy (+13); they also have less faith in the free market (-18 percentage points). 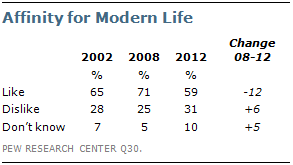 Nearly six-in-ten Chinese (59%) say they like the pace of modern life; just 31% disapprove. While the public is generally content with the 21st-century way of life, satisfaction is down 12 percentage points since 2008. People with higher incomes (73%) are especially likely to say they like the pace of modern life. Nonetheless, a 57%-majority say their traditional way of life is getting lost, compared with 29% who say their traditions remain strong and 14% who are unsure. Fully 71% believe their way of life needs to be protected from foreign influence; just 21% disagree. A decade ago, fewer worried about lost traditions (68%) or the impact of foreign ideas (64%). A plurality of Chinese are also concerned about the role of consumerism and commercialism in their country. Roughly four-in-ten (43%) say consumerism and commercialism are a threat to their culture. About a third (32%) takes the opposite view, and a quarter expresses no opinion.